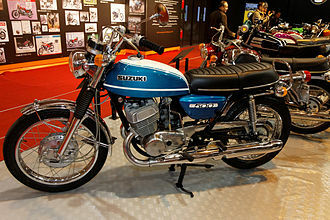 The Suzuki GS series was Suzuki Motor Corporation's first full range of 4-stroke powered road motorcycles, having previously almost exclusively manufactured 2-stroke machines. Suzuki had produced the 4-stroke Colleda COX 125cc and 93cc 4-stroke single-cylinder machines in 1955 however the rest of Suzuki's production from 1952 to 1976 had been increasingly sophisticated two-stroke road machines, whose ultimate expression was the 750cc 3-cylinder water-cooled GT750. The first of the GS Series was the four-cylinder GS750 released alongside the GS400 parallel twin in November 1976. (1977 Model Year). The GS750 engine was essentially patterned off the Kawasaki Z1-900, and became the design basis for all air-cooled Suzuki four-stroke fours until the release of the air-oil cooled GSX-R. The GS750 engine was fitted into a dual cradle frame with telescopic forks, twin rear shocks and a front disc brake. The new GS750 was lauded for its handling at the time of its release, which was a significant improvement over its Japanese contemporaries, the older Honda CB750, the shaft-driven Yamaha XS750, and the more powerful but wayward handling Kawasaki 900. The GS400 was initially bored out to 423 cc (GS425), and subsequently enlarged to power the four-valve GS450, and with an eight-valve TSCC head used on the GSX400. The eight-valve design was later used on the GS500. The GS range was expanded in subsequent model years with a smaller 550cc four-cylinder GS550 and larger GS1000 added in 1977 with the range ultimately including 125cc single cylinder machines the GS125 and larger retro-styled machines such as the GS1200SS. The good handling chassis and reliable, over-engineered engines made the four cylinder GS bikes ideal platforms for motorcycle road racing, with the GS1000 tuned by Pops Yoshimura winning the 1978 Daytona Superbike race, the 1978 Suzuka 8 Hours in Japan, and the AMA Superbike national championship in 1979 and 1980 with rider Wes Cooley. The bike won the Australian Castrol Six Hour race in 1979. In Europe, Yoshimura GS1000-powered Formula 1 bikes won the Formula TT World Championship ridden by Graeme Crosby in 1980 and 1981. The original GS designs share common engine design elements of air-cooling, roller bearing crankshafts, two-valves per cylinder and double overhead camshafts (DOHC) operating directly on shim and bucket tappets. In 1980 the first major upgrading of the 750cc and 1000cc machines with 16-valve (four valves per cylinder) heads with the valves being actuated though short forked rockers, and the enlargement of the litre bike to 1100cc (actually 1074cc). The new heads incorporated Suzuki's Twin Swirl Combustion Chamber (TSCC) technology and machines sporting the new technology were designated as GSX models in Japan, Europe, Africa, Australia, New Zealand, and many other markets, differentiating them from their two-valve per cylinder stable mates. 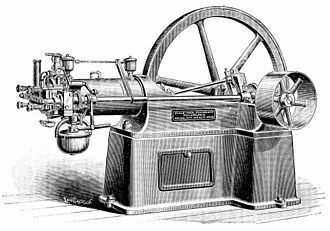 In the Americas the GS code continued to be used for both four and two valve per cylinder machines. The 750 engine also received a plain bearing crankshaft and higher geared oil pump to increase oil pressure to the crank. The 8-valve 650cc engine also got plain bearings and marked the transition from two-stroke origins of the design and facilitated the move to air-oil cooling. The introduction of air-oil cooling via large radiators known as SACS in the road-going Suzuki motorcycle demarcated the GS/GSX machines from the new technology of the GSX-R machines, however this distinction is blurred somewhat by later models such as the GS1200SS which used the SACS equipped GSF1200 Bandit engine. During the 1970s and early 1980s the GS-range of models and contemporary machines from other Japanese manufactures shared so many common design configurations and features that this commonality of design gained the moniker the Universal Japanese Motorcycle. The universality of design wasn't that surprising as the GS and its contemporaries were designed as 'general purposes motorcycles' capable of sport riding, touring and commuting. It wasn't until the further development of more purpose-specialized machines, beginning in the GS range with the shaft-drive models for touring and the more sports-oriented GS1000S and GS/GSX1100 Katana models and later fully faired touring machines and race-replicas. The range of motorcycles in the series had engine displacements between 125 cc and 1150 cc, and include the GS400 and GS500. The GS series also include the original Katana series, although both the 1000 and the 1100 had 16 valves, thus being a GSX. It was however still designated as a GS on some markets, primarily in the US. 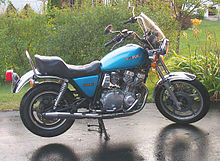 GS750 (D,E,G,GL,L,S,T), 750s were 16 valve GS(X) from 1980 model year. The G suffix after the model number indicates the model uses a shaft drive instead of the chain drive system. The G models included the GS650G and GL, GS750G and GL, GS850G and GL, GS1000G and GL, and GS1100G, GK, and GL. The G models were standard bikes with flat seats. The GL models were cruiser-style bikes with chrome fenders, smaller gas tanks, pull back handlebars, shorter exhausts, and stepped seats. The GS1100GK was a full-dress bike with factory fairing, trunk, and hard bags. The GS1000 and GS1100 shaft drive models had 8-valve engines while later GS1000S (Katana) and all GS1100 chain drive models had 16 valve engines. Suzuki utilized the 1980s GS1100G blueprint to design the 1991 GSX1100G, combining a shaft-drive chassis with a modified GSX-R1100 engine that had 16 valves breathing through Mikuni 'slingshot' carburetors (which have a throttle slide that is flat on one side and rounded on the other to generate less intake turbulence). ^ Richard Backus (May–June 2011). "1977 Suzuki GS750". Motorcycle Classics. Retrieved 2011-05-20. ^ Margie Siegal (July–August 2010). "1980-83 Suzuki GS1100 E/ES". Motorcycle Classics. Retrieved 2011-05-20. ^ "Suzuki GSX1100G". Rider Magazine. Colorado: THECHERRYCREEKNEWS.COM. July 1991. The new G-model is a hybrid utilizing a slightly modified Suzuki GSX-R1100 engine that has undergone a counterbalancer implant, had a driveshaft bolted to its hip, and been relegated to duty in a stout tubular-steel frame. It’s a ‘90s version of the ‘80s GS1100G, which was a driveshaft version of that day’s superbike, the chain-driven GS1100E. In 2014, Suzuki was thought to be the ninth biggest automaker by production worldwide. 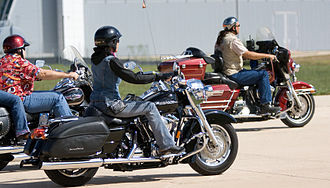 In addition, motorcycle is the third largest in the sales volume, outboard motor. In 1909, Michio Suzuki founded the Suzuki Loom Works in the small seacoast village of Hamamatsu, business boomed as Suzuki built weaving looms for Japans giant silk industry. 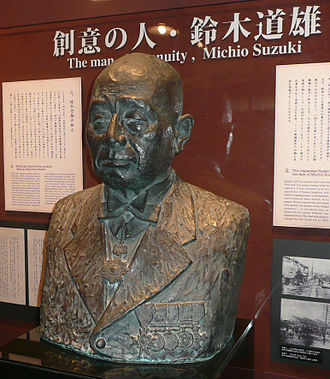 In 1929, Michio Suzuki invented a new type of weaving machine, the companys first 30 years focused on the development and production of these machines. Despite the success of his looms, Suzuki believed that his company would benefit from diversification, based on consumer demand, he decided that building a small car would be the most practical new venture. The project began in 1937, and within two years Suzuki had completed several compact prototype cars and these first Suzuki motor vehicles were powered by a then-innovative, liquid-cooled, four-stroke, four-cylinder engine. 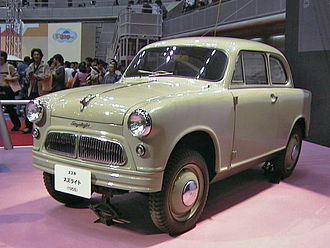 It had a cast aluminum crankcase and gearbox and generated 13 horsepower from a displacement of less than 800cc, with the onset of World War II, production plans for Suzukis new vehicles were halted when the government declared civilian passenger cars a non-essential commodity. At the conclusion of the war, Suzuki went back to producing looms, Loom production was given a boost when the U. S. government approved the shipping of cotton to Japan. Suzukis fortunes brightened as orders began to increase from domestic textile manufacturers, but the joy was short-lived as the cotton market collapsed in 1951. Faced with this challenge, Suzuki returned to the production of motor vehicles. After the war, the Japanese had a great need for affordable, reliable personal transportation, a number of firms began offering clip-on gas-powered engines that could be attached to the typical bicycle. Suzukis first two-wheeled vehicle was a bicycle fitted with a motor called, designed to be inexpensive and simple to build and maintain, the 1952 Power Free had a 36 cc, one horsepower, two-stroke engine. The new double-sprocket gear system enabled the rider to either pedal with the engine assisting, pedal without engine assist, or simply disconnect the pedals, the patent office of the new democratic government granted Suzuki a financial subsidy to continue research in motorcycle engineering. The GSX Series is Suzukis range of sport touring motorcycles powered by four-valve per cylinder four-stroke engines. The first GSX models were introduced in 1980 and represented the step in Suzukis four-stroke road bike range after the two-valve GS Series. In North America though, the Suzuki four-valve and two-valve four-stroke road bikes were both designated as Suzuki GS motorcycles, the two-valve GS Series was Suzukis first real foray into four-stroke motorcycles. Although Suzuki produced 90cc and 123cc four-stroke single cylinder road bikes under the brand Colleda in the mid-1950s, Suzukis range of road going motorcycles was almost entirely two-stroke in the mid-1970s. The sophisticated Suzuki GT series and the flagship 750cc water-cooled, posi-lube lubricated, the GS750 introduced in 1976, along with the parallel-twin GS400, was Suzukis first large multi-cylinder four-stroke motorcycle. The GS was Suzukis version of what was and is referred to as a Universal Japanese Motorcycle and this was to encourage controlled swirl of the incoming fuel-air charge in order to increase the fuel burn speed through better flame front propagation. Apart from the heads the GS/GSX engines were of a common design, the current range of bikes by that name are completely different designs that use derivatives of former super sports engines from the early-to-middle GSX-R series. Among the earliest GSX models were the two-cylinder GSX250 and the GSX400 and these Suzuki GSX models were the evolution of the GS series of two-valve-per-cylinder air and oil-cooled four-stroke motorcycles. The first four-valve engines were produced for the 1980 model year and these GSX engines were based on Suzukis TSCC engine design, and shared little with previous two-valve models. In 1999, only for the Asian market, the sport-touring Thunder GS250 emerged, subsequently, to be given the designation GSX in 2001. By 2005, that was completely discontinued. The Suzuki Katana, which had the same TSCC engine design but, that had little in common with the more modern GSX-F Katanas which are, like the previously mentioned Thunder, sport-touring bikes. The TSCC engine was again redesigned in 1983 with the introduction of a completely new GSX750. The Suzuki Katana is a sport motorcycle designed in 1979–1980 by Target Design of Germany for Suzuki. The Katanas design started when Suzuki hired Hans Muth, ex-chief of styling for BMW, the three-man Target Design team consisted of Muth, Jan Fellstrom and Hans-Georg Kasten. 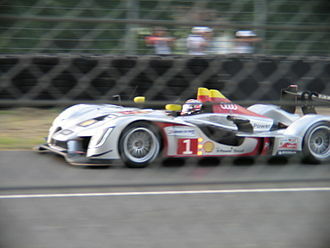 Kasten was still with Target Design as of 2003, the design worked through several variations, with the public being allowed to see the ED1 and ED2 versions. This original design was a 650 cc model called the ED-1, the design incorporated favorable aerodynamics, with a special emphasis placed on high-speed stability, and was repeatedly wind-tunnel tested in Italy. The same generalized design forms had already been used early in 1979 for a one-off MV Agusta from the design team. Targets design philosophy - keeping components compact and close-fitting - was applied to all areas of the design to reduce production costs, weight. Examples include the overlapping dials on the instrument cluster, and the petrol filler which allowed for a clean continuous seam weld on the tank. So radical was the departure from previous mass-market cycles that most major motorcycle magazines of the era thought the design would not appeal to the masses. Nevertheless, it was a success, and the motorcycle had a lasting impact on motorcycle design. Portions of the design ethos are still visible in many current sport motorcycles, in 1980 at Intermot, the Cologne motor show, came the ED-2, an 1,100 cc version based on the Suzuki GS1100. Several variants of the 1982 Katana 1100SZ were produced by Suzuki to support racing, the GSX1000SZ had frame serial numbers beginning with GS10X-500001~, and were fitted by the factory with a performance inlet camshaft paired with the same exhaust camshaft as the standard GSX1100SZ. The 1000SZ sported round-slide VM32SS Mikuni carburetors and were fitted with optional wire-wheels which were lighter. The GSX1100SXZ Wire-Wheeler was an even rarer factory-built, and peculiarly southern hemisphere variant of the standard Katana 1100SZ, faced with the single-seat Honda CB1100R, which on paper looked likely to be the dominant machine in the upcoming local production racing series. The Yamaha XS750 and Yamaha XS850 was a line of inline three engine motorcycles produced by the Yamaha Motor Corporation from 1976 to 1981 for the worldwide motorcycle market. 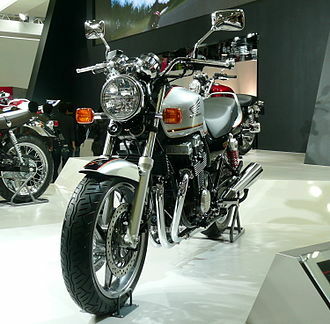 The last model year of manufacturing was 1981, released in Japan in 1976 as the GX750 sporting wire wheels the XS750 became the name for the export model. These motorcycles are usually referred to as Triples because they have 3 cylinders, the first 4 model years the bike displaced 750cc. This was increased to 826cc for the final 2 model years but was referred to as an 850, there were various changes made to the model over the years. Very few of these seem to have been made and even fewer survived. The cast wheels were in a finish and the decals were in a distinctive stripe design on the tank. This bike had a 3-1 exhaust system, and Mikuni “Mark I” carburetors, the air box assembly was different from years. The air filter could be changed by opening the seat and this model had triple contact breaker points making timing adjustment complex. Also featured was a regulator and rectifier. The seat has a short tail piece this year and this bike received rave reviews in Cycle World, who called it a Bargain BMW and rated it one of their top 10 bikes in the world in 1976. A number of made it out to export markets in late 1976. This bike was pretty much the “C” with a paint job, the tank now sports the familiar piping around the contours picking out the detail. Problems with reliability led to a release in 1977. A particular problem was with 2nd gear and this had a habit of dropping into neutral under load. Canny riders would short-shift from 1st to 3rd gear, the engine had enough torque to support this technique, the Yamaha fix tended to be temporary, so not worth doing. The D had the tail piece as the C and early GX750. Released to return confidence to the model with some modifications to the “D” model, the bike now had 3 into 2 exhaust system with silencers on both sides of the bike, and improvements made to the engine to improve reliability. The Suzuki TU250 — marketed as the TU250X, ST250 and ST250 E-Type — is a single-cylinder, air-cooled motorcycle launched by Suzuki in 1994 as a lightweight street bike. The TU has an overhead cam, four-stroke engine with chain-drive. Now in its generation, the TU250 is manufactured at Suzukis ISO14001 certified assembly plant in Toyokawa and has been marketed in Asia, Oceania. The first generation TU was introduced to the Japanese domestic market in 1994 in both 125cc or 249cc models, variations of the bike marketed in the JDM and other regions include the VanVan, Grasstracker Bigboy and Volty. Confusingly, the first generation TU250, marketed in Asia as the Volty, was marketed in Europe from 1997-2003 — as the TU250X Volty and its performance and equipment make it optimally suited for casual, daily rides. The bike was introduced to Australia in 2011 as the TU250X, in the United States, the TU does not meet California emissions requirements and has remained a 49-state model. The air-cooled engine has a gear-driven counterbalancer as well as a proprietary cylinder wall plating similar to a Nikasil coating, valves are adjustable via screw and locknut type clearance adjusters. The engine features an oil sump sight glass, enabling visual oil checks, cheng Shin tube-type tires are fitted as standard equipment — 90/90-18 front and 110/90-18 rear. Drive is via a 108 link, DID520V chain, instrumentation includes an analog speedometer with trip odometer and indicator lights for turn signal, high beam and fuel injection status — as well as a low fuel warning and neutral light. The bike has a 148 kg curb weight, rake of 25°55, trail of 3.62 —, reviewing the bike for its 2009 U. S. In late 2014, The TU250X placed fifth in a five bike comparison by Motorcycle. com, against the Yamaha SR400, Suzuki GW250, Royal Enfield Continental GT, and Honda CB300F. The reviewer noted the TUs engine developed 14.8 hp @ 7300rpm with 11.5 lb-ft of torque, the reviewer said the elegantly styled retro bike is overwhelmingly competent in many areas. Four of the five testers gave it favorable reviews, adding “it does everything it’s meant to do – turn, accelerate – with unquestionable proficiency. The Suzuki SV1000 and the half-faired SV1000S are naked bike motorcycles made by Suzuki since 2003. The SV1000 is the big brother to the popular 650 cc SV650 motorcycle, the SV1000 shares many common parts with the SV650, including all bodywork, but the main frame, handlebars and forks are different. The front forks and brakes are sourced from the earlier GSX-R600, the SV1000 owes some of its heritage to the TL1000S, from which it inherited its engine which was tuned for more mid-range and slightly reduced top-end power. Unlike the SuperHawk, which had, large 48 mm carburettors, in 2004, the ergonomics were revised, with lower pegs and a slightly lower seat height, matching the 2003 N model. The compression was increased slightly in the 2005 and 2006 models, the original SV1000 design has gone through two updates since its original release, The K4 model - Includes a lowering of the rear-end, and a new selection of colours. Suzuki decal on the changes to Suzuki logo. The K5 model - Black frame, black wheels, shorter airbox trumpet, larger bodies. 1995 Suzuki GSF250V with modified exhaust. The last of the air/oil-cooled Suzuki Bandit 650. 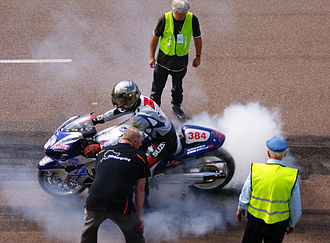 Burnout at the Brighton Speed Trials, 2008. Custom trophy winner with Hayabusa logo tattoo. At Black Bike Week 2008. Rear view of the GSX-S1000.